The weather is bad here too, Queenbarbiej. I was hoping to do my full two-week grocery run, but turned around and headed back after the truck thermometer read 31°. It's bitterly cold and raining. I was afraid of it turning to sleet. Better to be safe at home than play games with the weather! Janice, I mailed my package out and just emailed you the tracking number. The lady at the post office was admiring my fabric as I was addressing the envelope, so I explained to her about the swap. She thought it sounded like a lot of fun! Thank You, Janice! Will gladly follow along. I like the idea of a swap where we'd get to do whatever block we chose with the fabrics. I'm not too sure about my keeping up with your group though. Make 19 blocks in two months? Go Sooners!! I think you're right, Jaba! I know mine have improved since my first boom swap. Today the wool rug pad I ordered (for my ironing board) arrived! Yay. I love pressing on it! The only thing is they shorted me 2" in both directions from what I ordered. Couldn't get through on the phone, but I emailed them and asked them to send the right size asap. This one doesn't quite fit my board, tho I will use it until the other one comes. My ironing board was so "hard"... this is really quite an improvement! Making a Very Hungry Caterpillar quilt for a child tonight. I'm not sure my name was intended to be highlighted. Since I'm new to the Booms and not sure I can do more than one block per member, I only want to commit to one (so, 13 total). I hope I didn't accidentally sign up to double up, did I? Zozee, don’t give it a thought. Just send me 13. I’m away from my lists right now so I’m not sure how I goofed but it’s no problem! Hope to mail mine mine tomorrow before the frigid temps arrive. Thanks, Janice. I thought I had screwed things up! Zozee, not at all! I put a check mark beside the wrong name. I always count on there being a goof or two. Years ago when I started doing this, I used to freak out anytime I made an error. Now I count on it happening. I'm a big girl now and can deal with my mistakes much better. LOL. The list follows. Those highlighted should send me 19. Zozee and NanaKathy55 should send me 13. FYI, I've gotten emails from several people in both groups noting packages are on their way. Looks like they will start arriving tomorrow. Be sure to send me your tracking info right away. I have more packages coming in than i have emails so if you haven't advised me, please do. Thanks. Have a good day, Boomers. QUOTE=Jani McC;8198129]Zozee, don’t give it a thought. Just send me 13. I’m away from my lists right now so I’m not sure how I goofed but it’s no problem! My package should ship today - sent an email with the info last night. I'm excited to be starting on this - it's so fun to pick out interesting blocks to try, knowing I only have to make one! And I get to play in my stash picking out colors for each block, and I can use FQ and smaller chunks because I don't need enough for a whole quilt. To me, this is total play time! I agree, Macybaby! I've been looking through all the block patterns from the links shared earlier. I love sampler quilts. We had a pretty bad ice storm last night. It took my husband over three hours to get home, but I'm just so glad he was able to get home! Here is my fabric for the sooner group. 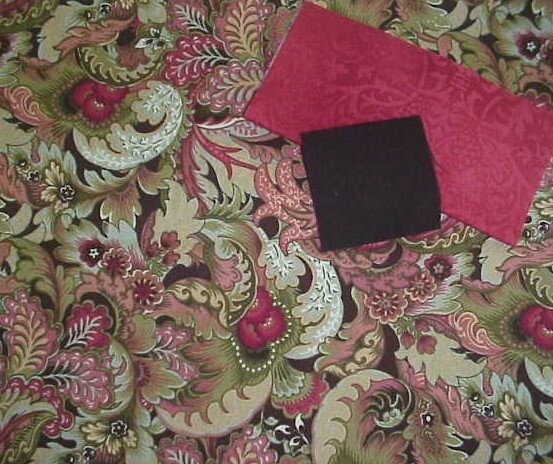 Dark brown and rusty red in solid or tonal with a cream or COC background. Here's the fun fabric I've chosen from my stash. The quilt we make with it will either be a donation into Baltimore's foster care system (a friend of mine is a social worker) or it'll be a tummy time quilt for when my grandtwins come to play . I'll decide that later. I'm asking that Sooner Boomers use any color you see in the cupcake fabric except black or white. I have plenty of this fabric, so if you mess up, don't be afraid to ask me to send you another Fat 8th. Zozee, the cupcakes are very cheery! That’ll be fun to work with. And Cheese, I love the colors! I think they’ll make stunning blocks. I have mailed off my fabrics this morning. 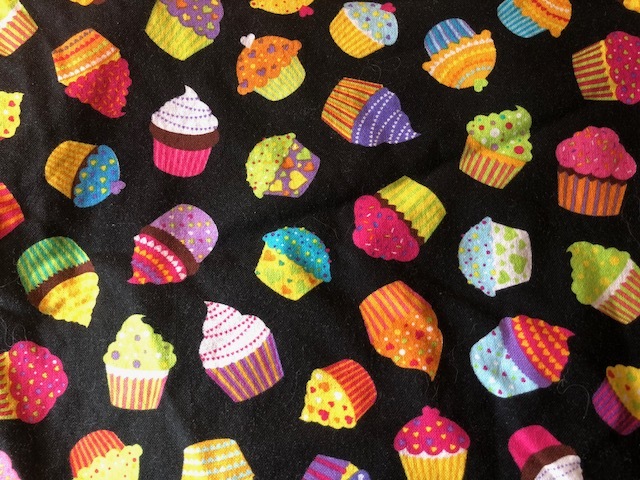 The cupcake fabric looks fun and yummy. I already have a few ideas on that fabric. Darling fabric Zozee, looking forward to making a block with your fabric! Oh Cheesehead, I love your fabric!! So glad I will get to create with a piece of it. Zozee, the cupcakes will be fun to work with too. Cheesehead where do you buy all your gorgeous fabric? Cheese your fabric is beautiful....SO glad its in the sooner group.. One thing I dont like about the cupcake fabric..it makes me want to make some and eat them all!!! Seriously its beautiful...food blocks are always so fun to make. Janice I mailed mine today ,should get there Sat...tracking ## is in email. Lovely fabrics being shared here! Because I miscut some of my cupcake fabric, only 9 pieces ended up as fat 8ths. So I searched my stash for coordinating fabric that I can incorporate into the same quilt. 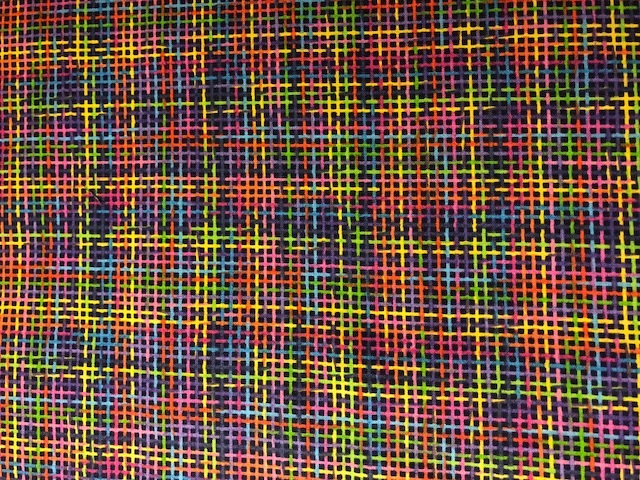 I cut 4 fat 8ths of this rainbow plaid (grid? weave look? what do you call it?) . I am asking that you use any of the colors in this fabric, but please only solid or tone-on-tone so it doesn't get too busy. I like your “weave” print, Zozee. I’ve had that one before. It will go great with the cupcake fabric. Zozee, what’s the scale of the pic? Extreme closeup?